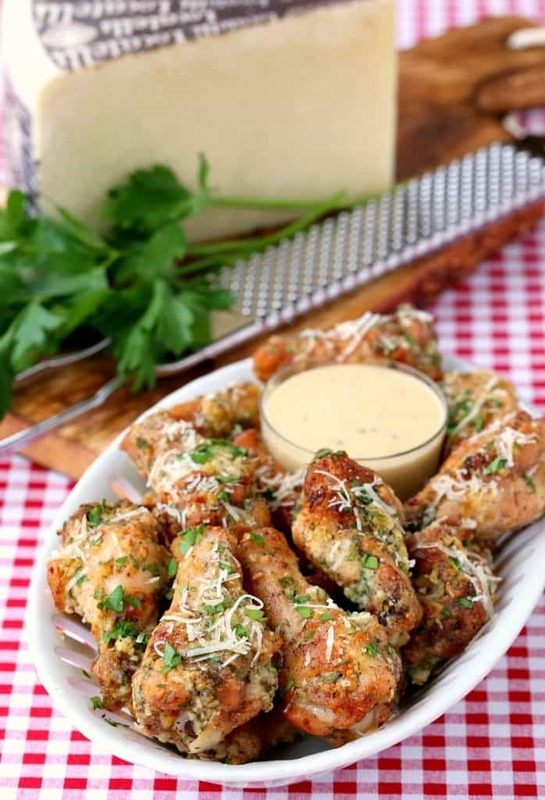 These Baked Garlic Parmesan Chicken Wings are perfect for appetizers! 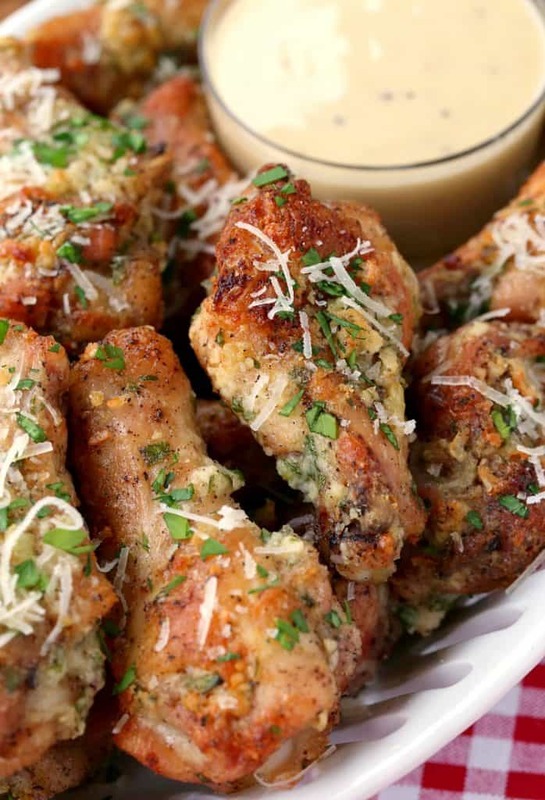 Crispy, baked chicken wings with a garlic parmesan sauce are so addicting! Best Baked Chicken Wing Recipe! Yes, this is a baked chicken wing recipe. They aren’t fried. But you’d never know it. These chicken wings are so super crispy and fall off the bone tender, you’ll wonder why you ever fried chicken wings before this. 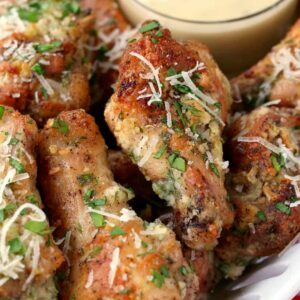 The sauce on these Baked Garlic Parmesan Chicken Wings is literally made up of butter, parmesan cheese and mayonnaise. I mean, fat on top of fat on top of fat. And that’s why these wings taste so damn good. I’m telling you, you won’t be able to eat just a few…you’re going to keep grabbing for more after each one. So I guess the good thing is that if you follow a low carb diet these are the chicken wings for you. These baked chicken wings are only going to run you about 1 carb per wing. That’s should give you a pretty decent amount of wings to eat and still stick to your low carb diet so read on. These Nacho Chicken Wings and these Sticky Hoisin Chicken Wings are also delicious baked chicken wing recipes that you should try, both recipes are also fairly low carb too! I think I might jump on the low carb bandwagon just so I can sit down and eat wings all weekend without blowing my diet. 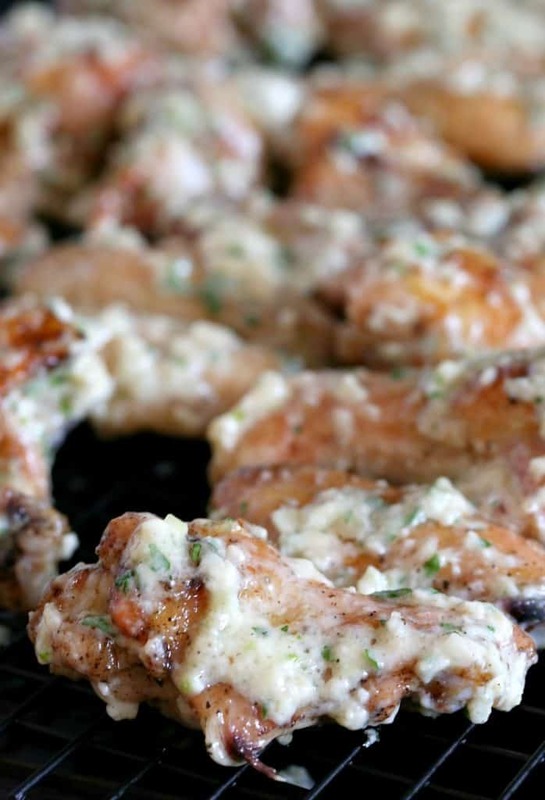 Any diet that I can eat these Baked Garlic Parmesan Chicken Wings on…I’m in 100 percent. When you go to start to make these wings, you might look at the recipe and say – 6 pounds of wings??? Yes, 6 pounds of wings. Of course you can cut the recipe in half, but you’ll probably be sorry if you do. These baked chicken wings are great cold from the fridge or heated up the next day if you actually have any leftover. Just me and my boys can knock most of these back…so make sure you have plenty. 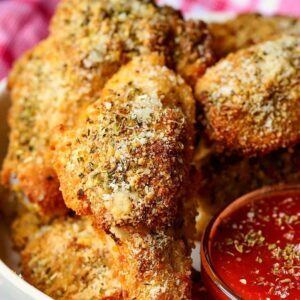 And if you’re making these garlic parmesan wings as an appetizer recipe, you certainly aren’t going to go wrong with the 6 pounds. First of all, we have to talk about here is how you like your garlic parmesan wings. If you like them like how they serve them at Buffalo Wild Wings, super saucy, then you’re going to bake these wings, toss them in the sauce and serve. Or If you like them a less saucy, with more of the sauce baked on then you need to bake them, toss them in the sauce, and then bake them again. That’s how we like them – baked again and super crispy – but it’s totally up to you. We did snack on a few of these low carb chicken wings all sauced up before we put them back in the oven and we loved them, because I like to go for one more bake. Let’s get started by seasoning these chicken wings with salt, pepper and garlic powder. Bake them for a half an hour then take them out to toss them in the garlic-parmesan-butter-mayo-sauce. It’s like we talked about, serve as is or back in the oven for a few minutes…if you can wait that long to eat them. 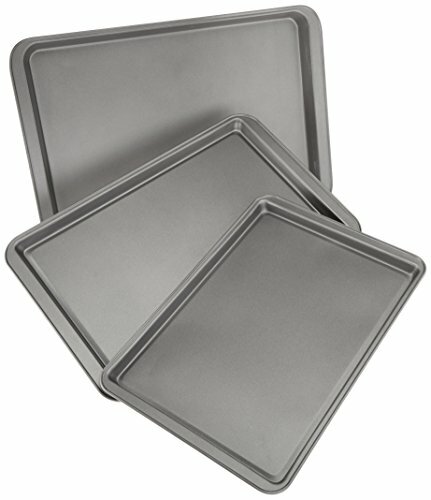 Grab a couple off the sheet pan for snacking on while they bake for a second time. You’re probably going to be drooling at this point. Now just add some more parmesan cheese and chopped parsley for garnish and get them on a plate. 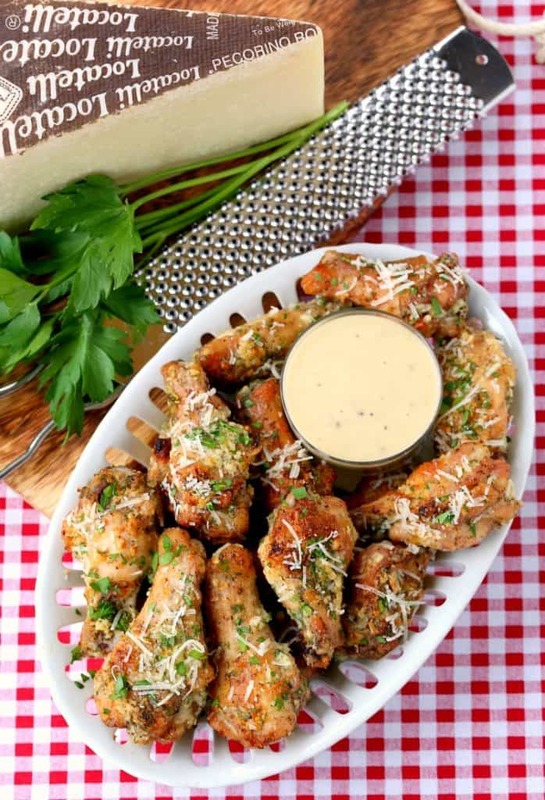 Whether you’re serving these baked chicken wings for appetizers or a fun dinner at home, they are without a doubt going to be a monster hit! Seems like everyone is looking to make their favorite chicken wing recipe at home these days! Hopefully you’ll love this chicken wing recipe as much as we do! 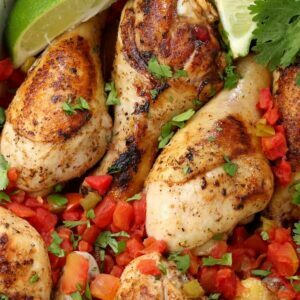 Looking For More Chicken Wing Recipes? These super delicious chicken wings are a low carb appetizer or dinner! 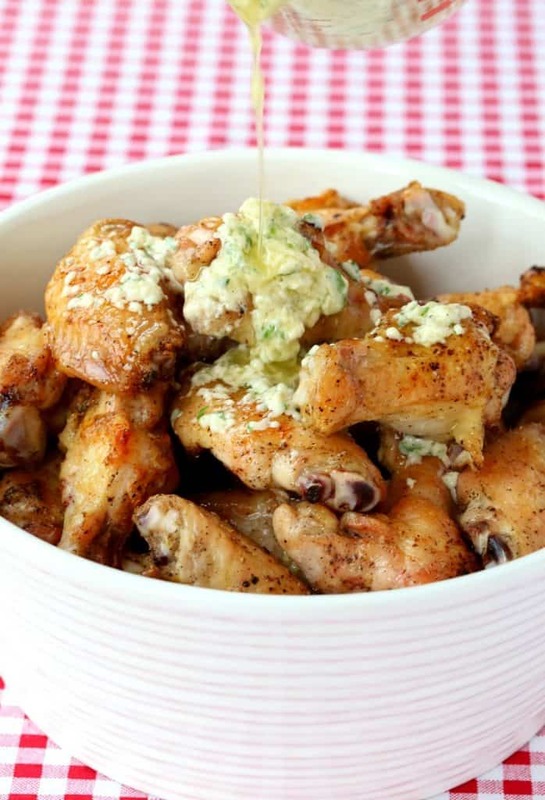 Try these baked chicken wings at your next party! 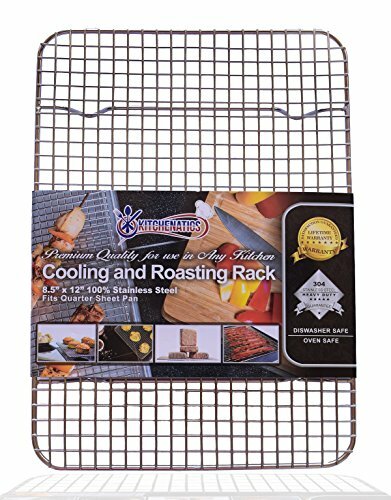 Season the wings with the salt, pepper and garlic powder and place on a rack on top of a baking sheet covered with foil. Bake the wings for 35-40 minutes. While the wings are baking start the sauce by adding all of the ingredients to a bowl and whisking together. The butter will separate a little as it sits, that’s ok, just whisk it together again before you toss the wings. Once the wings are done, add them to the bowl with the sauce. Place the wings back on the rack and bake again for 8-10 minutes. 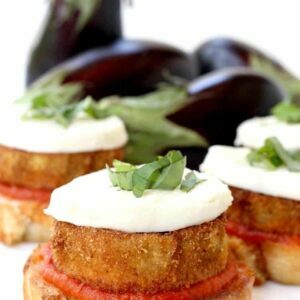 Garnish with more chopped parsley and shredded parmesan cheese, then serve with caesar dressing on the side for dipping. What is 2 tbsp of hopped garlic? It’s chopped garlic, I updated the recipe card. Good Lord! Could you possibly add any more advertisements to your page? Good luck, but I won’t be back. Sorry to hear that Andy, this is a free recipe site that takes hours and hours of work on my end to bring you the best possible recipes and photos that I possibly can. Scrolling through a few ads is all you need to do to get the recipes! Good luck to you too. To anyone that reads blogs regularly, they should know that bloggers have ads all over the place to supplement their time & energy it takes to create these for others enjoyment. I agree that the ads are a tad annoying, but it is a job to do this and it beats asking for donations that no one will contribute to. Some people just want to have their cake and eat it too. Now that I’ve had MY 2 cents to the previous comment, I would like to say that I just discovered your recipe blog today and enjoy reading it, as well as, anticipating trying what I’ve found so far!! Thank you for sharing them!! I’m also going to share your site with my son, who considers himself a Foodie. Would love it if you had an email notification when you have new posts. Thank you for taking the time to comment here Beth! It does take a lot of time to get these recipes and posts together so I do appreciate it. If you go to my homepage, right below the social media icons it has a sign up area where you can put in your email and receive the new posts! Let me know if you have any trouble doing this. Thanks again! Any ideas on what i could substitute for mayonnaise? 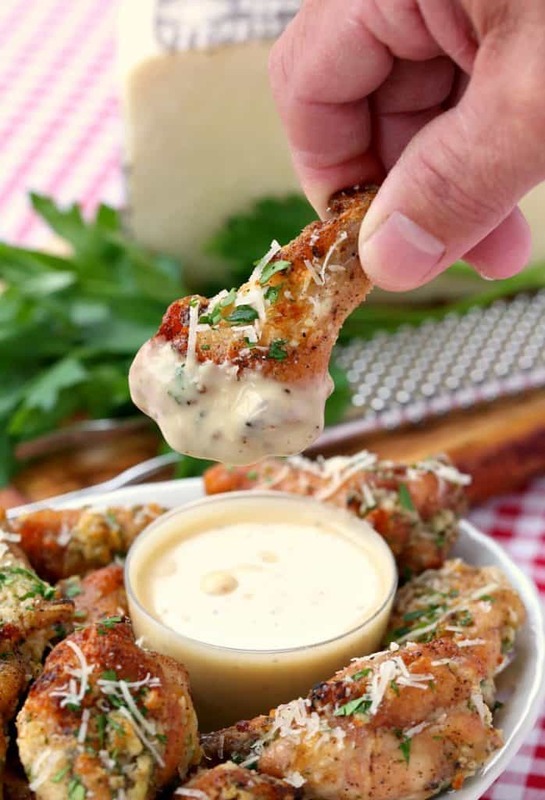 I have been using the sauce to toss wings from our air fryer in and we LOVE them, but mentally can’t get past the mayo part. I really don’t, I’m sorry! The mayo gives the sauce the best flavor! Do you not like mayonnaise in general? No, I don’t like it at all. My husband is okay with it. I substituted sour cream the last time i made them, it made the sauce creamy, but separated much more than the mayo. 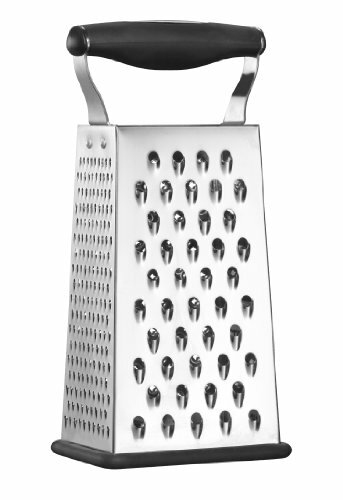 have you tried cream cheese maybe? We don’t eat butter any longer. If I were to cook them in olive oil, how much would I use? The wings are actually baked, the only butter is in the sauce. I’m not sure how olive oil would work instead of the butter but you could give it a try! Dan I made these wings tonight and they were so freakin’ delicious! My boyfriend was so impressed and I told him to thank Dan. ???? So naturally I had to leave a comment. These wings are So worth it! Thanks!! That’s awesome! I have to tell you…that’s how my wife got me, her cooking! 🙂 Enjoy! This was super great, thank you! So happy you liked them, they are a favorite weekend recipe of ours! Jim, these wings bake uncovered as per the recipe – and they are super crispy! If you did cover them while baking then, yes, they wouldn’t be crispy at all. I hope you try them again! It did t say in the recipe if the chicken wings were fresh or frozen. I am going to use a big bag of frozen. Hi Ken drummers and wings. 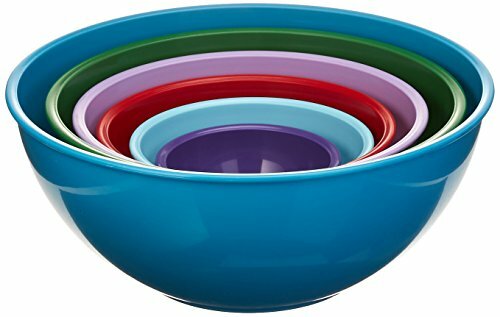 Would there be any cooking time different? 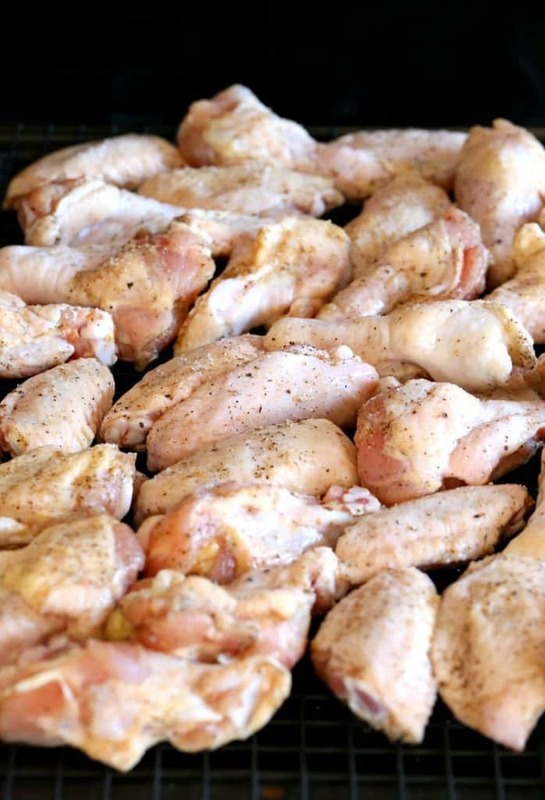 Yes, this recipe is for fresh wings, Just let the wings defrost before cooking. Yum! Thank you so much for this recipe. I made this last night and my son whom does not like chicken wings absolutely loved this. Please keep the recipes coming. That’s awesome! Love hearing that, thanks for letting me know! Well, I’ll never make wings any other way than this ever again. I’ve been searching for that perfect wing recipe for literally years, and I’ve finally found it. I’ve made these twice now, with perfect results both times. I’m making them again tonight because they’rejust so dang good. No substutions, just the recipe exactly as written, which is unheard of for me. My husband and son love these wings as much as I do. Restaurant wings pale in comparison to these, but I don’t mind, since they’re even easier than driving. Thank you! Thank you so much for the super nice comment! We love them too, I’m so glad you stick to the recipe on this one…they are so good!